Today's Reader Spotlight is on - Vidhi. I absolutely love the idea of interacting through this medium. It will help us so much, to to know that whatever we, the readers, are trying to draw from your blog is going in the right direction or not. I have always loved how you Mix & Match Indian outfits and pull it off as a western outfit and vice versa. This one idea, inspired from your blog, saved me recently at a friend’s wedding. I had absolutely nothing light in ethnic wear. I had heavy lachas or salwar suits and needed something lighter yet ethnic for the routine (smaller) functions. 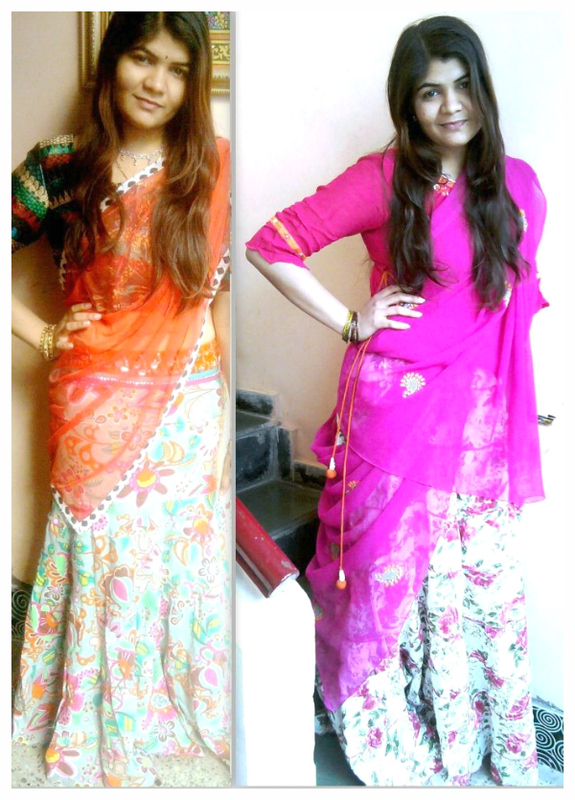 So I picked up these long skirts and teamed them up, once with an embroidered blouse and once with a kurti (tucked in). Added the dupattas from the salwar suits to complete the “Lacha” look. It worked just fine. I am super thankful to your posts, they proved exceedingly face-saving for me . Much love and big hug for the fabulous blog . Firstly, I am enjoying this series A LOT myself, because so many readers are coming in to the 'Spotlight' from the hiding. Thank you so much for writing it, because it is so wonderful to hear from you. I for one am all about comfort and less bling in Indian wear. I love how Vidhi has created an outfit out of long skirts, tunics/blouse and a dupatta. Even I hadn't thought of adding the dupatta when I wore a version of this look. It is not visible in these shots, but I do hope that you added some good accessories & footwear with the look, to give it an ethnic vibe. Would you all be brave enough to Mix & Match in an Indian outfit? P.S. Genuine feedback is welcome, nasty criticism is not. Yesterday I entered the StyleBlogger contest at Refinery 29. Now that I have entered it, ... I kinda wanna win it! Would you please CLICK HERE -> scroll down till you see my pretty face (?) and hit the ♡ on the left-hand-corner? Simple. What's in it for you, you ask? Well, you get my undying love in return. Its a fair deal if you ask me! :o) Thank you so much in advance and ya'll have a wonderful weekend! thats a lovely look, and yes i will do what u have asked for to get ur undying love. Voted! now.. lead lead lead lead... good luck! A big ( online )Hug to Vidhi for not only looking fabulous but also for having the talent and creativity to come up with such an unique sense of style which is so rare ! Your new header is nice! OMG - she looks so beautiful and what a creative idea - I'm gonna steal it lol!! thanks for sharing. You have started a good trend of Mix & Match. Vidhi has done well in this. Voted for you Tanvi :D All the best! Love the looks ... had been waiting to see some mix-n-match ideas on the western-to-indian-to-western lines ! and I love the showcase too! Voted! Great post; I love the look on the left - different patterns and colours. So glad you entered the Refinery29 contest! Best of luck my dear! wow, i've loved this post,so good to hear (and see) how ur ideas work for others! even i mix indian wear and westerns from time to time... i used to wear traditional in India all the time and i brought all the salwar kameez and dupattas to Spain with me, so i keep using them. her looks are definitely elegant. and i voted for you, of course! What did I miss? oooh, Gorgeous girly in hot pink! LOVE! Good luck with the Refinery 29 contest! Wow! There are so many fashion bloggers....some are really really good! This series indeed is a WIN! I love the colors Vidhi is donning. Bravo girl, Bravo <3 especially when I am trying to learn this art. I love this series Tanvi. Keep em coming. Vidhi, this is a great look. I don't have many Indian clothes here and this is a great tip on how I can make the most of what I have.